Does your bathroom feel a little snug? Do the words tiny and claustrophobic come to mind when you think of it? When helping clients buy and sell condos in Boston, I hear the woes of small bathrooms nearly every day; however, if you have a small bathroom, don’t despair. Working with your bathroom’s current footprint can be challenging, but it’s not impossible. You can increase the physical space, improve the perception and the feel of space, and enhance the functionality of even the smallest bath with these tips. Create wall niches: Avoid eating up precious floor space by leveraging the area inside your walls. The space between the studs is usually 16 inches apart, while the depth of the stud plus the drywall on the front may give you a little over four inches in depth… perfect for niches to house your toiletries and other essential items, to position a towel rack or to store soap and shampoo within the shower. Reclaim door space: Pocket doors take up zero space in a bathroom and are often ideal space-saving solutions or practical fixes for a door banging into a tub, for example. If you door swings inward and a pocket door isn’t an option due to structural constraints, consider flipping it around so that it opens out away from the room. Find great spots for shelving: Shelving isn’t a new idea for wall-mounted storage. But is there a spot that you haven’t thought about for those shelves? How about the end wall of a tub? Or the space above the door? You could also run open shelving above your vanity mirror or the full length of just about any wall as long as it is high enough so that you won’t bang your head. Toilet paper, rolled-up towels or even decorative accessories can be stored attractively in this way. 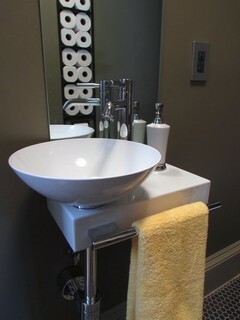 Slim down the vanity: Save real and perceived space by installing a smaller vanity, a pedestal sink or a wall-mounted sink, which frees up floor space and can give the room a unique and unexpected look. Even if they’re not particularly small, console tables help expand the perception of space thanks to their slender legs and openness. Or, you might try using a bowl-shaped vessel sink, which frees up almost the entire top of the cabinet on which it’s mounted as usable counter space for toiletries. Use the corners: A corner sink, with or without a vanity, is a great space saving solution in a small bathroom; it maximizes valuable space and often helps allow clearance from a door that opens inward or even the shower door. You can also make use of awkward angles or corners by filling them with shelf units. Downsize your toilet: Consider replacing your old toilet with a compact, elongated model. It’s the same size as a round-front toilet but provides the comfort of an elongated seat. Or, you might try a wall-mounted toilet, which can work well with contemporary décor. Take the tub down a notch: Think about swapping your old tub with a lower-profile model to help open up sightlines and make the bathroom look more expansive. Try a five-foot tub with a flat bottom. They’re perfect for showering, but still deep enough for a pleasant bath. 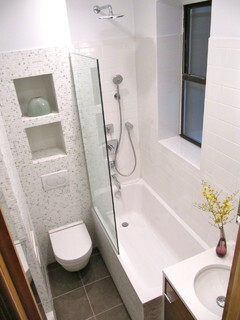 Replace the tub with a stall shower: Consider getting rid of the tub entirely. 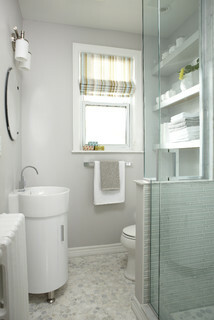 A frameless glass shower will make your space look bigger. Keep it bright: A light, bright space is always more attractive and inviting, and in the bathroom in particular, light improves functionality. Recessed ceiling lights are a good starting place, but are sure to provide task lighting, such as sconces, around the mirror. Light paint colors and floor tiles can help, too. By using some imagination and a few simple tips, you can turn your cramped bathroom into a cozy retreat—without having to move any walls. What are your secrets for making a small bathroom feel bigger without changing the footprint? Posted on Nov 20, 2013. Posted in Architecture & Design, BilusOnBoston, Home Improvement, Small Space Solutions and tagged corner sinks, decorating small bathrooms, fixtures for small bathrooms, pedestal sinks, renovating small bathrooms, small bathroom storage solutions, small space solutions, vessel sinks, wall niches in bathrooms, wall-mounted toilets.